Greek roasted potatoes are my comfort food, especially during Easter/Holy Week for the Greek Orthodox Church. We generally go meatless during this time, and many remove all animal products. Today, most families might adjust their fasting according to their schedule and family needs. This dish made in a large batch may ease the fasting routine for the family to get them through their busy week. Who doesn’t love a entire plate of roasted lemon potatoes? With young kids it’s often a challenge, but if you think about all the possibilities there are many. As kids we often had grilled cheese sandwiches, vegetable pizzas, spaghetti, quiches, soups, and the list go on. Beans and lentils often are on the menu symbolizing the tears of the Mother of God. The typical holy week meal is: Lentil Soup, olives and boiled vegetables, halvah and fruit. Take a look at the many posts on my blog of Lenten Dishes here. Baked potatoes in the oven with lots of lemon and sprinkled with garlic, and I’m in heaven. Many dishes in the Greek cuisine use this basic recipe for chicken and potatoes, lamb and potatoes, or any side dish you wish. The secret to these potatoes is the amount of lemon you add. Using a good extra virgin olive oil can also make the difference. An oil with a fruity note will give the hint of freshness that it needs. One dish you must add to your weekly planner. It's easy with pantry ingredients, and one recipe everyone loves. Serve it with any entry. Place the potatoes on a large sheet pan, in a single layer. Add the oil, garlic, oregano, salt, lemon, and stock or water. Bake in the oven for 30-35 minutes until potatoes are fork tender. Add more liquid if necessary, gently mixing during baking. Place under the broiler for 5-10 minutes to brown the potatoes, if needed. 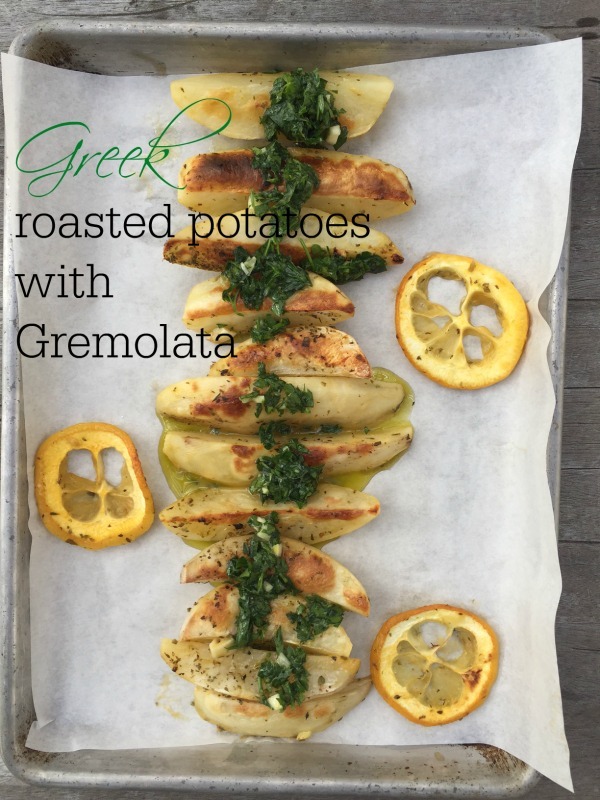 Serve with the Gremolata sauce. 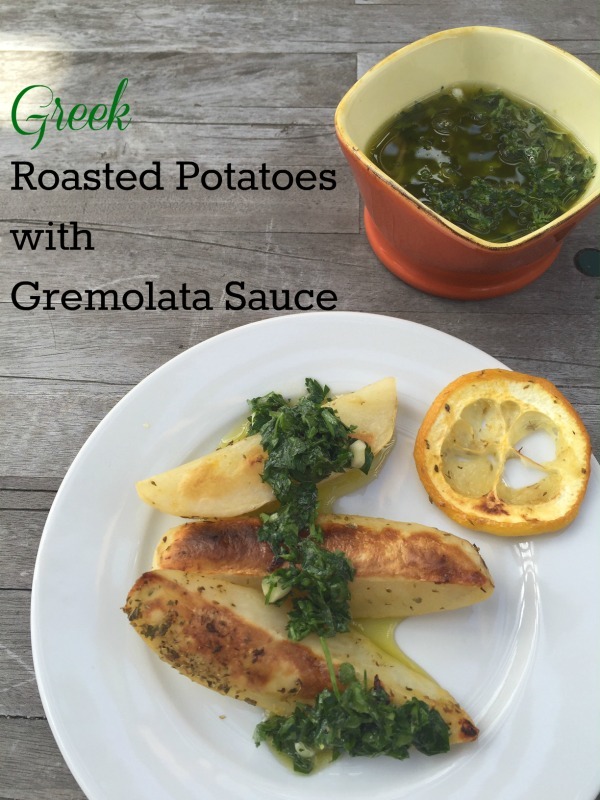 I added a herbal touch to these potatoes with a Gremolata sauce. A fragrant sauce that can be added to just about anything. Use it as a rub for meat, chicken, fish or vegetables. A fresh fragrant sauce that can be used as a dip, rub or condiment. In a small bowl, combine the parsley, zest and garlic. Stir in the oil, mixing thoroughly. This sauce is best when made earlier in the day. © 2016 – 2018, Mary Papoulias-Platis. All rights reserved. 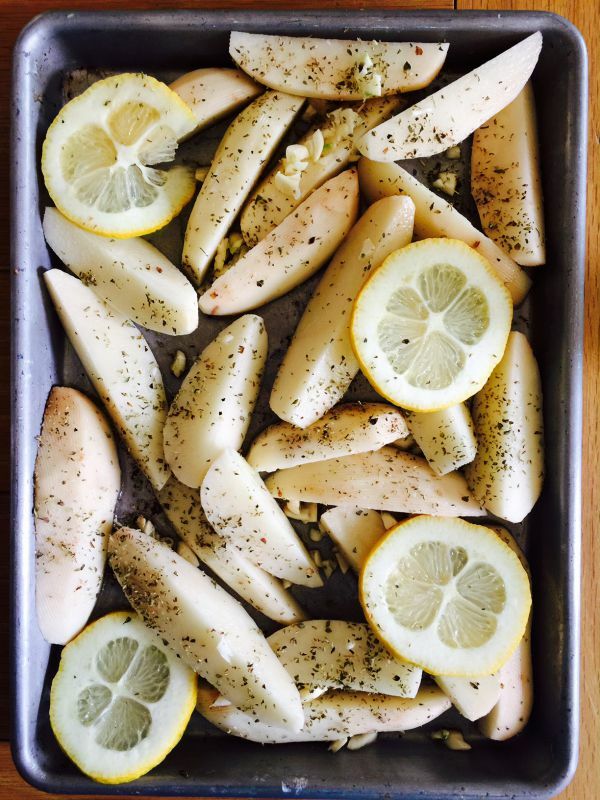 Oh man, my lemon-loving kids would gobble these potatoes up! I’ll have to make this for them ASAP! You know I’m holding you to this! This is my Greek comfort food haha! Thanks Barbara! Nothing like slathering this sauce on them too!